Ahead of the Essentially Marilyn exhibition’s grand opening at the Paley Centre in Los Angeles tomorrow, Olivia B. Waxman uncovers the story behind this signed photo – taken during filming of The Seven Year Itch – showing Marilyn with Fox talent scout Ben Lyon, in an article for Time. 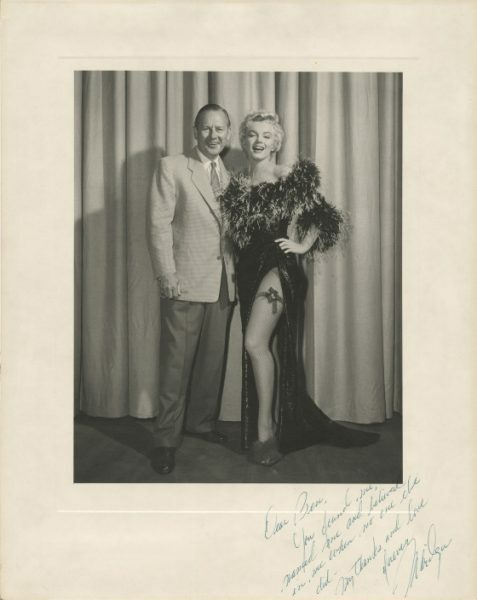 The photo – to be sold at auction by Profiles in History in October – refutes some of the more outlandish rumours about how Marilyn got her name (I’m looking at you, Mickey Rooney.) It won’t be news to longstanding fans, however, as biographer Fred Lawrence Guiles first quoted Marilyn’s words to Lyon back in 1969. “The above photograph — inscribed by Marilyn Monroe to Lyon: “Dear Ben, You found me, named me and believed in me when no one else did. My thanks and love forever. Marilyn’ … [is] Considered to be one of the most important photographs in Hollywood history because it debunks myths about how she got her iconic stage name, it could fetch more than $100,000, according to Profiles in History CEO Joseph Maddalena, who runs the auction house that specializes in Hollywood memorabilia. He said photos autographed by Monroe usually fetch between $20,000 and $30,000. So how was the name Marilyn Monroe chosen? Next PostNext When Will ‘Fellow Travelers’ Make It to Broadway?